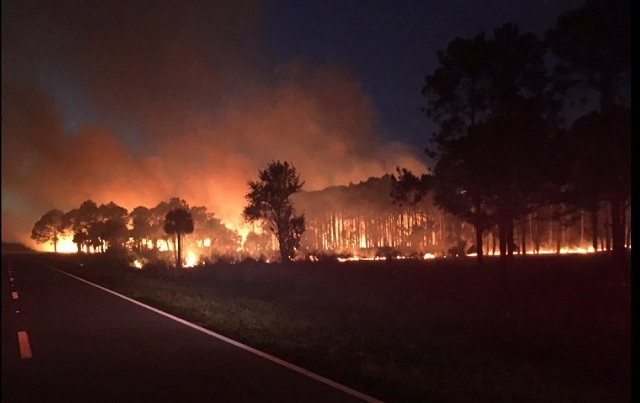 MERRITT ISLAND, Florida - Firefighter with the Southeast Region of the US Fish and Wildlife Service Fire Management Division battled a 500-acre wildfire that erupted in the Merritt Island National Wildlife Refuge Sunday night. The fire, dubbed the Sonny's Fire, quickly spread due to dry conditions and winds from a 100-acre fire near Haulover Canal into a 500-acre fire that approached the Volusia County line. Smoke from the blaze can be smelled throughout Brevard County north of State Road 520. According to the National Weather Service, low relative humidity and dry vegetation will continue to pose a moderate fire risk on Monday throughout east Central Florida.